The truth of life dissolved in you. If you are looking for superior water purifier not just for pure but true water for life, you are lucky to be here. Hello, I am Serguei Fedorovich Roudnev, Ph. D, scientist-oceanographer, water & wellness expert from Toronto, Canada. I started to distribute superior water purifiers for true water for life since 1991 to demolish the mess on the market of drinking water filters. Because people do really need not just pure, but true water for life, I became an authorized Multipure® independent distributor for superior Multipure® drinking water systems, ID#397754. If you are living in USA or Canada, become a distributor yourself to start making money from home without investment or any obligation. Never build up any illusion regarding the safety of tap water and you won't get frustrated anymore! In fact no matter how safe is tap water at Municipal Water Filtration Station in your City. Why? Because of numerous cracks in the underground pipeline, the water becomes much more polluted and intoxicated with a long list of dangerous to life pollutants (like heavy metals, oil, rat poison, drugs, feces, gasoline, E-Coli, viruses, etc) which may be found in the soil. And the more rainy days we have the more dangerous tap water should be due to more intense so-called "water exchange" taking place under the ground level. What happens in real life? When people come back home from a job in the evening they turn on tap water faucets at the same time... Pumps are too weak to provide all people with water at once with a proper pressure - so the air empties appear inside the pipes. When the air bubbles reach the location of the crack on the surface of the pipe, the soil penetrates inside the pipe due to the difference of pressure (pressure gradient) in and outside the pipe. So that the water becomes intoxicated and unsafe for drinking and cooking. The same situation was in Walkerton Town in 2000 in Canada, ON (https://en.wikipedia.org/wiki/Walkerton_E._coli_outbreak) where 2200 residents were dramatically sick at once, and some even died. I mailed the recommendation to replace all pipeline directly to 2 ministers of ON (Health and Environment Ministries). Nobody said to me "thank you". Remember - this is an international problem. So what is a better solution!? First of all, please stop buying unhealthy plastic bottled water - the ocean is severely and dangerously polluted already (watch this video - http://www.wwf.de/aktuell/pinguine-auf-plastikmuellinsel/)! Plastic which the bottle is made from is a real poison due to dangerous chemicals which are dissolved in water you drink. A recent study conducted by the independent Orb Media non-profit journalism organization found that over 90% of all disposable plastic bottled water around the world is contaminated with plastic fibers and microplastic particles (https://www.multipure.com/purely-social/2018/04/marketing-minute-multipure-april-2018/) Protect your health and save this planet - get the right water filter today. No matter where you live — in Canada, the USA, Russia or China. Tap water is always safe only for the toilet room. Tap water becomes more dangerous after boiling than before! A lot of people around the globe are still living with an illusion by drinking a tap water without proper and safe filtration. For example, tap water in Toronto city is contaminated mostly by industrial pollutants imported from the USA in terms of Niagara Falls. On the other hand, tap water should not be safe for drinking because more than 90% of the water we have to use for washing and toilet. Why should your government waste your money for flushing a toilet with high quality drinking water? This is really stupid. However, we have one more problem, that is visible only for experts — not any purified water is safe for inside. Without proper education there would not be a true decision for you. Since that moment, you start thinking about it yourself, you would be able to understand all without unfair information on TV. It’s my duty and pleasure to help people like you to understand water much better. The time has come for the truth about the water we drink. Not any clean and pure drinking water is safe for your health, but only hard & alkaline. The use of soft water for inside increases the risk of heart and brain disease, osteoporosis, obesity, and many more. Don’t be fooled by ads on TV about "pure" water with 0.00 ppm of TDS, because these are a commercial fraud and ambush for simple people. From the scientific point of view, the use of soft water breaks mineral balance in the human body. Soft drinking water can be called #1 invisible terrorist kindly and widely presented on the market as distilled water, reverse-osmosis water and just like any water without minerals, Ca & Mg! To provide you with the scientific understanding of water, I created "Classification of water for life" in 2005 shortly presented here as follows. My suggestion was successfully approved by many scientists and simple people all over the world and at last scientifically documented by ***International Symposium on Health Aspects of Calcium and Magnesium in Drinking Water (24-26 April 2006 Baltimore, Maryland, USA). Type 1 can be transformed into type 2 by boiling that makes water more acid and soft, so that multiple boiling of water is not recommended Attention! Type 2 is not safe for inside Breaks a mineral balance Risk of heart & brain disease, obesity, osteoporosis, arthritis, etc. To protect human health all drinks, including beer, juice, wine, and whiskey have to be made with Type 1 water. Notice. Get to know the difference between alkaline & alkalizing. Instead of consuming alkaline water or alkaline food I recommend to consume an alkalizing water and food. Hard drinking water (with most important minerals as Ca & Mg) and mineralized food will be alkalizing the human body from inside out and controlling the stable value of true pH, which varies in different parts of the human body (for instance, pH in stomach is 3, but in some places of colon pH is 7 as well as inside healthy cells). Otherwise, the usage of alkaline water (Kangen Water Systems, Xooma products, etc.) and alkaline food would damage normal pH balance in a stomach and colon system. Remember. Science is not always truly presented on the market today. The truth is mostly ugly crooked by anticipated profit. Get educated truly yourself. I recommend you superior water purifier - CLICK ON PICTURE TO BUY NOW, model Aquaperform (MP880SB). The triple warranty provides you with 3-month money back guarantee, including your postage fee, 1-year warranty on all parts and faucet, lifetime warranty on the stainless steel case. You can even become a distributor yourself to earn extra income by working from home. — www.multipureusa.com/rsf. First of all, thanks to the unique and powerful material named activated carbon fiber, which is applied inside any MP model and recognized as the most advanced adsorbent which is million times more powerful in comparison with activated carbon. Activated carbon fiber is patented material. That’s why Multi-Pure filters are purifying considerably better and lasting greatly longer than any filter on the market. Multipure water filter is a biological system because an activated carbon fiber kills bacteria and viruses, that's why filtered water is free of any bacteria and ready to be drunk without boiling. Multipure Drinking Water Systems are the Best Buy on the market for Finest Quality (exceeds NSF standards! ), Ecological Safety (no resin, iodine & silver! ), Biological Safety (no more cysts, viruses, parasites! ), Low Price (1 cent for 1 liter!). But much more important for health & longevity is True Organic Water with Ca, Mg & pH=7. As evidenced by independent laboratory testing and the certification of Solid Carbon Block filters, Multipure has been successful in developing the technology to produce filters that provide greater chemical adsorption and mechanical filtration. Materials are formed into a densely compacted Solid Carbon Block; compression enhances the kinetics of the filter and provides performance that cannot be achieved with granular activated carbon (GAC) filters. Compacted Solid Carbon Block filters have a large surface area to better facilitate adsorption. With a Solid Carbon Block, the water contact time is longer and provides for greater adsorption of many different chemicals, including pesticides, herbicides, and certain heavy metals. A close review of product listings confirms that Multipure's Drinking Water Systems are among the few that have been certified to reduce PCBs - a particularly difficult contaminant to reduce. The advantage of Aquaperform (MP880) is obvious and crucial. There is a big and invisible problem with water in Northern America (USA & Canada) as Arsenic is presented in natural water resources in wells, underground water, tap water and in most liquids as milk, juice, and beer produced domestically. Arsenic or rat poison is a powerful poison, that is dangerous even in the smallest dose. The officially "safe" concentration of Arsenic is 10 ppb (1 ppb = 1/1000 part of 1 ppm). 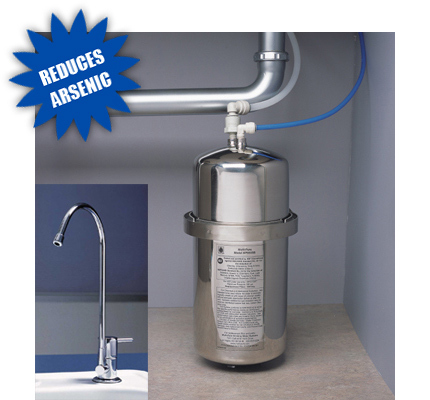 And there is only one — Aquaperform (MP880) water filter on the market today that removes Arsenic from water. I recommend you to drink always a beer imported from Europe and tap water filtered by MP880. It is better than tap water, bottled water, and all other water filters on the market today. True organic water — there is nothing better for people’s life. The only right type of water we have to use for inside is true organic water — hard and alkaline. The water passes through a pre-filter that traps dirt, sand, and particles that affect the taste and overall appearance of the water. After passing through the pre-filter, the water then passes through the solid carbon block, where particles as small as 0.5 microns are physically trapped by the filter. Asbestos, cysts, and particulates are reduced through mechanical filtration at the sub-micron level. The pre-filter acquires a positive molecular charge as water passes through it. Since most contaminants exhibit a negative charge in water, the filter fibers electrokinetically attract these negatively-charged particles onto the positively-charged filter surface. Generally, these particles are too small to be trapped by mechanical filtration. The carbon block filter is a blend of selected activated carbons and other media that reduce aesthetic contaminants and health-related contaminants by adsorbing particles to its surface. Because the carbon block is densely compacted, it provides a longer contact time with the water, and thus, better performance than many other filtration technologies. Particulates - miscellaneous physical particles that can cause turbidity (general water cloudiness). We know bacteria and viruses can make you sick, but what are they, exactly? Bacteria are microscopic organisms that can be found in the air, in the water, and on the land. Although some bacteria are actually beneficial, others can cause serious illness. These harmful bacteria are known as pathogenic bacteria. A virus is a type of microscopic infectious organism that consists of an acidic nucleus in a protein shell. Viruses that infect humans and cause disease are called enteric viruses, and included such viruses as hepatitis A, rotavirus, and adenovirus. How Does Multipure Protect You From Bacteria and Viruses? Although the core of our drinking water systems' incredible performance is our exceptional solid carbon block filter, the key to bacteria and virus removal is through our Aqualuxe drinking water system and our proprietary PureBlock technology. This powerful additional layer of protection offers 6-factor removal of bacteria (99.9999% removal) and 4-factor virus removal (99.99% removal) from water. In addition, the filter utilizes mechanical filtration, physiochemical adsorption, and electrokinetic adsorption to reduce the presence of other harmful chemicals and contaminants. Multipure's Aqualuxe is NSF-certified according to NSF/ANSI Standards 42 (Aesthetic Effects), 53 (Health Effects), 401 (Emerging Contaminants), and Protocol P231 (Microbiological Purifier) for the reduction of dozens of contaminants. NSF Certification is a very high standard of quality, so you can be confident that our filters do exactly what we say they do. Why Do I Need to Remove Bacteria and Viruses From My Water? While some bacteria and some viruses can be benign, many bacteria and viruses in your drinking water can be very dangerous. Symptoms from exposure to harmful bacteria and viruses can include gastrointestinal issues, meningitis, hepatitis, and other very serious diseases. These are not organisms you would want contaminating the water you use to drink, prepare food, and cook with. Order Your Water Filtration System Now — www.multipureusa.com/rsf. If you are interested in protecting your drinking water from bacteria and viruses through Multipure's Aqualuxe drinking water system, or if you are interested in any of our exceptional water filtration products, please contact me, Serguei F. Roudnev, for more information. A man is just an intellectual form of water (like ice, snow, etc. ), invisible to him transforming to mold (when the mineral balance and pH balance are broken). Resume. It is impossible to compensate for the absence of Ca & Mg in water we use for drinking and cooking by using pills with Ca & Mg. These minerals have to be dissolved in water before we use water for health benefits. For most people this simple rule is still hard to believe. Think yourself about WHY?! P.S. MONEY LIKE WATER. WATER LIKE MONEY. LIFE WITHOUT GOOD MONEY LOOKS LIKE WATER WITHOUT GOOD FILTER.